Deborah Batts, U.S. District Court Judge in New York City, received degrees from Radcliffe College and the Harvard University Law School. Batts began her legal career with the firm of Cravath, Swaine, and Moore in New York City. Later she was appointed assistant U.S. Attorney in Manhattan. In 1984, she became the first African American appointed to the faculty at Fordham University School of Law (New York). After serving as an associate professor of law at Fordham for ten years, Batts was nominated for the federal bench by President Bill Clinton. The Clinton nomination was the second time that Batts’s name had been put forward for a judicial appointment. Her previous nomination in 1991, by President George Bush, was unsuccessful. But her mentor, Senator Patrick Moynihan, a New York Democrat, persisted and she was re-nominated by President Clinton in January 1993. Batts was confirmed by the U.S. Senate on May 5, 1994. When she took her seat on the bench in Manhattan on June 23, 1994, she became the nation’s first openly lesbian African American federal judge. 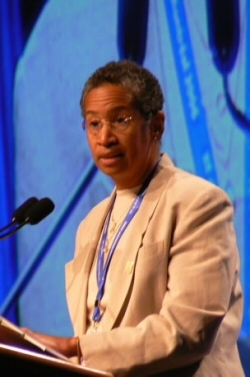 Gay and lesbian activists hailed the nomination and confirmation of Batts. A previous lesbian Clinton nominee, Roberta Achtenberg, had lost a nomination amid “furious opposition” from “the radical right” for the position of Assistant Undersecretary for Housing and Urban Development. But Batts, unlike Achtenberg, had not been identified as an activist for gay rights. Indeed, she had only come out openly in recent years. Batts, herself, once commented that “being lesbian is definitely part of my life…It is also one of many parts of my life. I am also a very devoted mother, an attorney, a former prosecutor and I’m an African-American.” In a 1994 talk to a group of Fordham Law School graduates, Batts asked them to work for the civil rights of all minorities, including lesbians and gay men. Source: Alton Hornsby, Jr. and Angela M. Hornsby, From the Grassroots: Profiles of Contemporary African American Leaders (Montgomery, Alabama: E-Book Time LLC, 2007), p. 21. E-Book Time LLC, 2007), p. 21.